Why LaMancha Goats, You Say? Let me first say, that I never liked goats. Oh I’m sure I maybe liked them when I was little, they are kind of cute after all, but several barns that I had my horse boarded at had goats (looking back I think they were pygmy goats) and let me tell you, they were horrible. In one barn the goat ate a horses mane and tail (before you ask, yes the goat was fed, it just evidently liked horse manes?) and when loose it would steal things from your tack box. 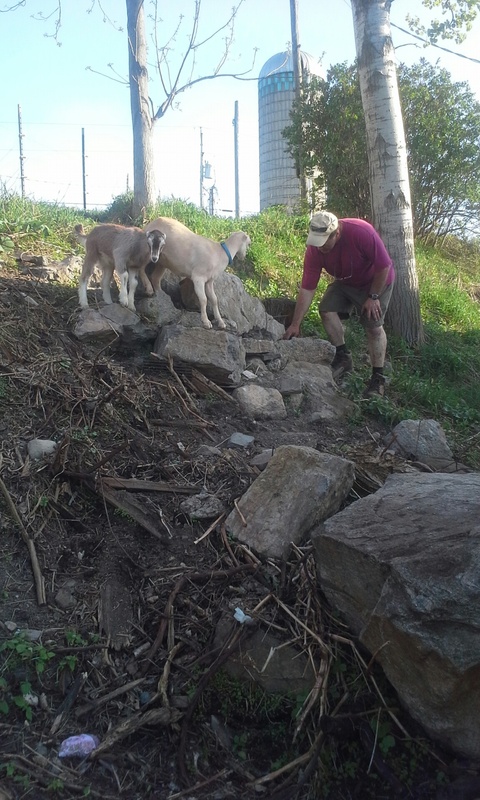 In another, the “billy” goat would literally chase people, when it wasn’t using the hay stack as it’s personal bathroom. Now as an adult I can recognize that those goats were just in the hands of people that really didn’t know how to care for them, but let me tell you, as a young teenager, I couldn’t stand them, they were obnoxious. Part of that attitude carried over into adulthood, and anytime someone would mention adding goats to our little farm I said no way. However as I began researching homesteading and self-sufficient lifestyles, goats kept coming up as a good alternative to having a milk cow. They take up less room, the amount of milk you get from 1-2 does is just right for a small family and you can get away with milking once a day versus twice. Those were just a few of the benefits advertised. I quickly came to the conclusion that maybe goats wouldn’t be so bad. So ok, we would get goats, hmmm what kind? Right away I was able to narrow things down somewhat since we primarily wanted the goats for milk production. We could cross off all of the “meat” breeds, but that still left too many choices. The biggest complaint people have about goats milk is the flavor, so thru my research I discovered that the Swiss breeds (Alpine, Togg, etc…) are much more likely to have a “goaty” flavor to their milk, so they were out. The Nigerian Dwarfs are known for wonderful sweet milk, but I kept reading that they can be difficult to milk due to their size and while they are heavy producers for their size, they just don’t produce enough for our family, plus cheese, plus soap. This really narrowed things down. I was initially drawn to the Saanen / Sables, but was a bit concerned about the low butterfat content. I was hoping to use goat milk instead of cream in my coffee after all. I liked the Nubians, but I kept reading how loud they tend to be (which just reminded me of how obnoxious the goats I knew as a kid were). Then I ran across the LaMancha. Ok, sure they may be a bit funny looking (but then again I have Naked Neck Chickens, so how weird could they be)and slightly resemble an alien, but they seemed like the total package. 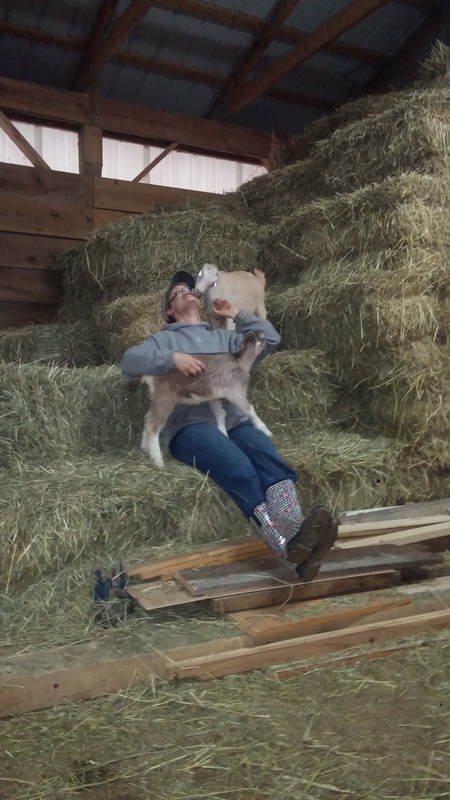 Good even temperament (temperament is so important on a small farm), not an overly loud goat. Good supply of milk (Blossom is giving about a gallon a day) with a slightly heavier fat content than some of the other breeds (which means I don’t mind not having ½ & ½ for my coffee), naturally resistant to many of the diseases that plague other breeds. Well by now I was pretty sure LaManchas were the way to go for our little farm. Now, here is the problem. LaManchas are just not as available as the other breeds, there aren’t as many breeders in NY, so they weren’t that easy to find. I kept looking and was just about ready to head down to PA (since that was about the only place I seemed to find kids for sale) when I happened upon a breeder over towards Albany. Hurray!! She only had one doeling listed, but I asked if she might have another available and sure enough she did.. Bali is a bit of a wild child, wants to climb and chew on everything, while Daisy has the tiniest little voice and just wants some cuddle time. They are opposite ends of the personality spectrum and honestly a blast to have around. A few weeks later we found Blossom. She wouldn’t be ready for another month because she needed to wean her triplet boys, but she was the Doe in Milk we had been looking for. She has truly been wonderful and is a great ambassador for the breed. Very mellow personality, she loves to go for walks, and is super gentle when asking for scratches. Very easy to milk out, she has a slightly, sweet milk that even our non-milk drinking daughter loves. Of our 3 LaManchas, 2 have an exceptionally easy going sweet attitude, and even though Bali is a bit more rambunctious, she is still a loving, friendly goat, always eager for a bit of attention. I couldn’t be happier with our little herd, and hope to share stories about them with you as they grow.